Haven’t done a two-for-one article in many years, but this seemed like the right time. I’ve ranked both of the HUNGER GAMES movies before, and just watched them consecutively in preparation for seeing the third movie this weekend. Since I’ve considered them separately (and the first one twice, no less), it made sense to look at them as a two movie arc. 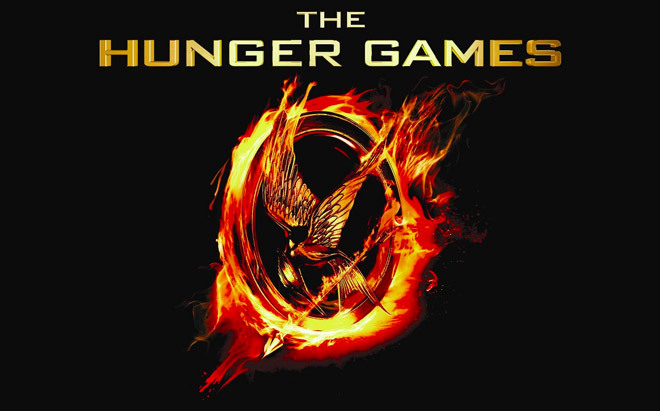 I watched THE HUNGER GAMES (2012) on 12.23.14 and THE HUNGER GAMES: CATCHING FIRE (2013) on 12.24.14. These were my third and second viewings, respectively, and first viewing since last November when the second was released in theaters. The first HUNGER GAMES starts frenetically. The shots are quick; constantly in motion, with the subject either starting out of focus, or out of frame, or (at least) not as the focal point of the frame. By the time the shot gains clarity, the editor cuts to a different shot. The first fifteen minutes runs this way. 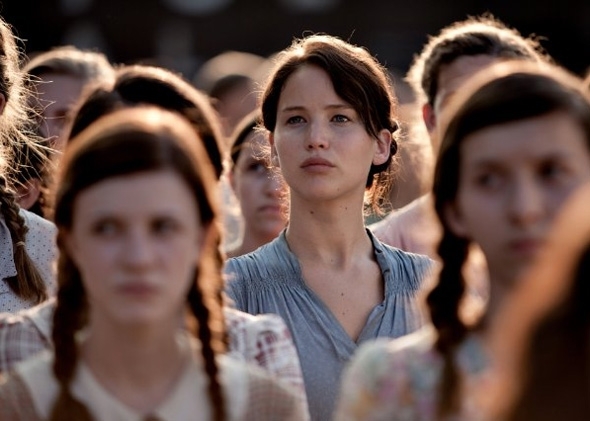 We don’t get a chance to settle into District 12, the home of Katniss (Jennifer Lawrence). She is comfortable moving in that world, but we as viewers aren’t meant to share that comfort. We watch as her sister is drawn in the lottery to participate as a participant in the annual to-the-death Hunger Games. 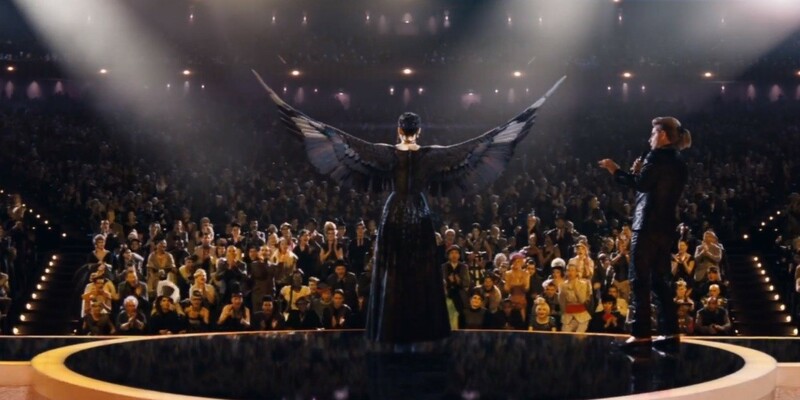 Katniss volunteers as tribute to take her place. We are whisked away with her as she meets her male counterpart from District 12, Peeta (Josh Hutcherson) as well as her survival coach: the previously victorious Haymitch (Woody Harrelson). It is at this point that the movie finally settles down and begins to look like the Hollywood blockbusters we know. Director Gary Ross has already made us uncomfortable in the world before we get our bearings, so mission accomplished. Through the remainder of the first film and into the second film (which is Directed by Francis Lawrence) the movies follow a basic formula. First we get a sense of Katniss through her friendship/relationship with Gale (Liam Hemsworth). Then some political stuff happens. Then there is a bunch of training during which we learn that evil President Snow (Donald Sutherland) is plotting all kinds of bad things. We learn that the Games, which are run like the Olympics in terms of fanfare, are being run by some all powerful overseer (Wes Bentley in the first film, Philip Seymour Hoffman in the second). Then the Games begin. Neither films see the Games ending in a way we are told is the tradition. For both films, the intrigue and power of story is garnered in the pre-Games stuff. While both movies do a nice job of filming the competition and moving the action along, the characters are developed and tested more in the real world than in the carefully contrived Games. Perhaps adding to that is the fact that the Games feel like the over-written part of the movies. While billed as a human-on-human competition, these fights for survival are much more likely to pit the heroes or villains against some man-created construct of the Games; be it a pack of computer-generated dogs, an unnatural poisonous fog, or a steaming shower of blood rain. It is worth noting that the Games sections of these movies are at their best when people are forced to confront each other. Due to both the PG-13 nature of these films and the young adult origin of the novels, however, these moments are few and far between. Yet, amazingly, these are movies which elevate themselves over the gimmick suggested by the title. The political intrigue is interesting. The love triangle works for the audience and allows Katniss to be humanized as someone who can love two people for different reasons on parallel tracks. For all of this to work requires actors up to the challenge. Lawrence, as is her reputation, is awesome. She is flawless as Katniss. It’s a role she was seemingly born to play. More importantly, the casting of the auxiliary characters is spot on. Be it Hutcherson’s slightly unlikable underdog Peeta, whom we have to grow to like, the maturation of a young actress like Willow Shields as Katniss’ younger sister, or even a surprisingly useful turn by Lenny Kravitz as Katniss’ first ally in the pre-Games political world. Also vital is Stanley Tucci as the MC of the Games. His Caesar Flickerman runs the hosting duties professionally, treating the Games like a mix between American Idol and the Roman Colosseum. Tucci turns a character that could easily be a caricature into a complex and important piece of the puzzle. He makes us believe that this could happen, that this could be seen as entertainment, and that people would go along with it. Also providing unexpected weight is Elizabeth Banks as the mouthpiece in the district selection process. Her ornamented Effie is snobby through the first several scenes. We don’t like her, but her excess is vital to understanding the Capital before we get there. The second movie humanizes her as she sees the Games as an unfair exercise for the first time. Her acts of kindness are useless in terms of practicality, but they are clear indicators as to how the ‘haves’ of this world live as opposed to the ‘have nots’. And, really, that is what these movies are about. These are stories of oppression leading to revolution. Even as the characters are coming along in an interesting way, it is not until the end of the second movie that we see anything other than a dichotomy in which the poor are fighting back and all the rich are either evil or ambivalent. The ending of the second movie promises something interesting from the final chapters of the film series. The first two HUNGER GAMES movies are everything you would want them to be. They are entertaining, interesting, and very well acted. Even if the source material doesn’t seem to be the most sophisticated piece of agitprop art, there is enough there to have led to a quality first couple of films. In both instances, I had previously scored the movies at 7.5 out of 10. So both saw an improvement in this viewing. ~ by johnlink00 on December 24, 2014.